The Carlton Hotel & Spa located in Edinburgh city centre is a superb place to visit for a relaxing spa day away from the distractions of everyday life. With spa day packages available for all budgets - from best value spa days to more expensive extravagant spa days, this venue is perfect for time in the city centre relaxing. Offering an ideal location, The Carlton Hotel & Spa is only minutes away from the famous Princes Street and the beautiful Edinburgh Castle. Included in all of the spa day packages is full use of the hotel spa and leisure facilities for the full day you’re at the hotel, giving you the option to stay as long as you wish to achieve your full state of relaxation. 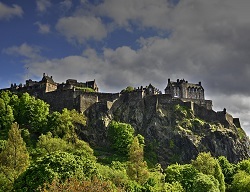 Edinburgh is a fabulous place to visit for the day or for a couple of nights away. Within this grand city are many things to do and visit such as the famous Jenner’s department store where you can shop until you drop or maybe a spooky Edinburgh ghost tour maybe your sort of thing. With so much to do and see in Edinburgh, it would be a challenge to try and do it all on your spa day. No deals have been found!